Xapix CEO Christian Umbach (@ChrisUmbach) is currently attending CES® 2018 in Las Vegas to get in touch with industry leaders and technology experts. At Xapix, we love to share our insights on smart cities and the future of mobility, and CES® is always a great opportunity to do so. At the event, we're presenting Xapix smart connectors, an easy and cost-effective templating solution that can be leveraged to connect legacy systems to thousands of the latest state-of-the-art applications in the smart city sphere. In this article, we'd like to share some thoughts on how such technologies can help cities become truly smart. Cities, communities, and municipalities around the globe are looking to spur innovation. The Internet of Things (IoT), connected devices, cloud services, and data analytics provide cities with a variety of means and digital opportunities that could potentially affect every single service they provide to their residents as well as their administrative tasks. Enabling cities to quickly leverage solutions that have already been developed and make them applicable for their specific context can foster innovation processes significantly. Whether this is a standardized way of communicating parking locations, public transport data or information about points of interest—with the Xapix connector solution cities can hide the internal complexity of their IT silos and make standardized, modern digital interfaces (application programming interfaces, “APIs”) available. Large metropolitan areas like New York, Singapore, and Shanghai have long been in the game of “big data” as they are able to afford large budgets for dedicated application development. However, hundreds of thousands of cities across the globe lack the financial capability to tap into the latest applications—innovation breaks off at this point. At the same time, many cities are being held back by their IT systems, which are mostly legacy systems (outdated systems in need of replacement) and custom builds (created for very specific applications with very limited adaptability). This leads to the fact that cities cannot easily adapt to new applications and standards, thus they’re not able to participate in the latest digital opportunities. Smart city applications live off data and integrated, connected services. Think of a system that can predict traffic congestions and actively counteract them by smartly guiding the masses through the city. To make such a system possible, a variety of data inputs have to be generated, analyzed, and interpreted in an integrated and time-efficient way. What is more, the ultimate goal is that such a smart application, once it has been developed for one city, should be quickly scalable to cities around the globe so that communities all over the world can profit from such an innovation. This requires consistent data that fits into a standard data model. FIWARE is one of the leading organisations setting standards for data models in general and also specifically for smart city applications. More than 100 cities are already following the leads of FIWARE to align their data outputs in order to leverage applications at scale based on FIWARE data models. Xapix currently supports the FIWARE standard. Learn more about FIWARE projects here. 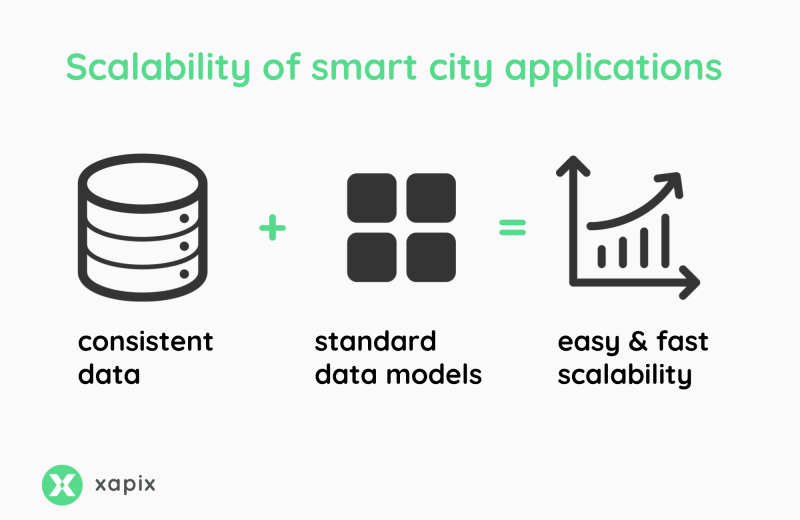 In order to empower cities to adapt to such data standards, Xapix has developed an easy and cost-effective templating solution that can be leveraged to connect legacy systems to thousands of the latest state-of-the-art applications in the smart city sphere. This way, the Xapix technology overcomes the basic problem that hinders cities to participate in smart, data-driven, and connected applications that have been outlined earlier. Using Xapix, developers can leverage a preset template to quickly link their existing data to the data models that are required by existing applications. Ideally, tasks that would have taken months using traditional means of data integration can be accomplished in just a couple of days. Best yet, Xapix also enables projects that would not have been possible at all. Data models exist for data ranging from parking locations to waste management, to museums and weather—the options and opportunities are manifold. Check out the cool Xapix templating functionality as well as the other great capabilities of our tool. Sign up here. It's free—and fun! 2017—what a year at Xapix!